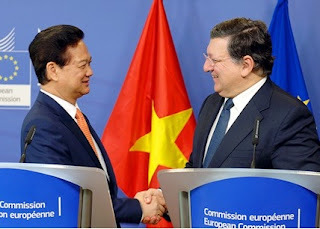 PARIS, 14 December 2015 (Vietnam Committee) – The Paris-based Vietnam Committee on Human Rights (VCHR) called on the European Union today to press Vietnam to commit to urgent, measurable human rights progress at the fifth round of the enhanced EU-Vietnam Human Rights Dialogue to be held in Hanoi on 15 December 2015. The dialogue takes place against a backdrop of escalating violence against Vietnamese human rights defenders and independent civil society. On 4 December, police cracked down on a Memorial Day ceremony organised by the Unified Buddhist Church of Vietnam at the Long Quang Pagoda in Hue. Hundreds of security police blocked UBCV pagodas in Hue and Danang and detained 11 UBCV leaders, including Thich Thanh Quang, Acting President of the UBCV’s Executive Institute and Buddhist Youth leader Lê Cong Cau during four days, to prevent them attending the ceremony. On 6 December, lawyer and former political prisoner Nguyen Van Dai and three colleagues were brutally beaten by plain-clothed security police in Nghe An after they held a meeting to discuss human rights and the 2013 Constitution. Dozens of security police, their faces covered, dragged the activists out of their taxi and beat them. They pushed Dai into a car, confiscated his cell phone and money, and kicked him out of the car some 50 kms away. Dai has suffered five such attacks, none of which have been investigated by the Police. This incident took place during a week of activities organized by independent civil society activists in Vietnam to mark the 67th Anniversary of International Human Rights Day on 10 December 2015. In a joint Briefer submitted to the EU at a civil society consultation on the Human Rights Dialogue held in Brussels on 26 November, the VCHR and the International Federation on Human Rights (FIDH) highlighted the alarming increase of Police violence as one of their key concerns. Mennonite Pastor Nguyen Hong Quang, activist Dinh Quang Tuyen, Catholic human rights defenders Tran Minh Nhat and Chu Manh Son, blogger Trinh Anh Tuan, labour-rights activist Do Thi Minh Hanh and journalist Truong Minh Duc were amongst the cases raised. 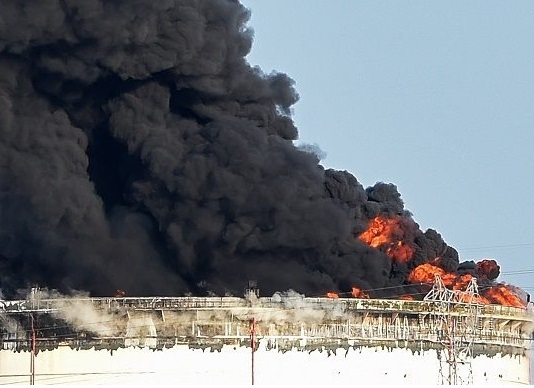 The latter two were beaten by police in the city of Bien Hoa while they were helping workers of the Yupoong Company to file for compensation following a fire at the plant. Police brutality is also widespread in the prisons. VCHR and FIDH reported that 226 people died in custody as a result of police violence in Vietnam over the past three years alone. Violations of freedom of expression remain severe. In 2015, journalists and bloggers faced prosecution and serious pressure simply for expressing alternative views. The VCHR and FIDH cited the cases of journalist Do Van Hung, fired from the prominent daily Thanh Nien (Youth) for mocking Ho Chi Minh on his Facebook; Kim Quoc Hoa, Editor-in Chief of Nguoi Cao Tuoi (the Elderly) newspaper, fired and prosecuted under Article 258 of the Criminal Code for “abusing democratic freedoms” and his newspaper closed down after publishing articles revealing official corruption; prominent blogger Nguyen Huu Vinh (aka Anh Ba Sam) and his colleague Nguyen Thi Minh Thuy, both arrested in May 2014, detained for 18 months without trial at the B14 Prison in Hanoi, in violation of the Vietnamese Criminal Procedures Code which provides for a maximum of 12 months pre-trial detention. They are accused of “slandering the reputation of the Party and State”, and risk prosecution under Article 258 of the Criminal Code. The Death Penalty, widely used in Vietnam, was also highlighted by the VCHR and FIDH. Due to lack of independence and transparency of Vietnam’s legal system, inadequate access to defence counsel and unfair trials, the number of wrongful convictions is alarming, with 18 such cases in 2015 alone. Thanks to strong international outcry, notably from the EU delegation in Vietnam, condemned prisoner Le Van Manh received a stay of execution. International NGOs report that the proceedings against Le Van Manh were characterized by procedural errors, and that his “confessions” were obtained under torture. Although Vietnam recently reduced the number of economic crimes punishable by death, crimes against “national security” invoked to suppress political opposition remain unchanged. Freedom of Religion or Belief, which is seriously abused in Vietnam, risks being further restricted under the new “Law on Religion and Belief”, currently under debate in the National Assembly. The draft law contains provisions allowing the government to interfere into religious organizations’ internal affairs such as the appointment of religious leaders, the content of religious training or education. It empowers the authorities to suspend religious festivals on grounds of “national defence or security”, and contains vaguely-worded provisions that could be used to discriminate against ethnic minorities and independent groups whose religion is perceived by the authorities as “foreign”. VCHR and FIDH urged the EU to demand Vietnam to cease the repeated harassments, arbitrary house arrest and restrictions on freedom of movement of Buddhist Youth leader Lê Công Câu, and called for the immediate and unconditional release of Thich Quang Do, Patriarch of the Unified Buddhist Church of Vietnam (UBCV), who has spent the past 30 years under different forms of detention for advocating religious freedom, democracy and human rights. In their joint submission to the EU, VCHR and FIDH expressed deep disappointment on Vietnam’s lack of progress in bringing domestic legislation into line with its international human rights treaty commitments. Despite firm commitments at its Universal Periodic Review to revise ambiguously-worded “national security” crimes in the Criminal Code, Vietnam has made no attempt to revise these laws. On the contrary, in the amended Criminal Code adopted by the national Assembly earlier this month, offenses such as “undermining national solidarity, sowing divisions between religious and non-religious people” (87), “conducting propaganda against the Socialist Republic of Vietnam” (Article 88); “abusing democratic freedoms to encroach on the interests of the state” (article 258); or “activities aimed at overthrowing the people’s administration” (Article 79) remained unchanged, except for their numbers. Whilst welcoming the early release of political prisoner Ta Phong Tan on 19 September 2015, the VCHR and FIDH deeply regretted that she was forced to emigrate immediately to the United States on the grounds that her sentence had been simply “interrupted” and she would be immediately incarcerated if ever she returned to Vietnam. This forced exile is a grave violation of Article 12 of the UN International Covenant on Civil and Political Rights which states that “no-one should be deprived of the right to enter his own country”. PARIS, 16 November 2015 (IBIB) – The Most Venerable Thich Quang Do, Patriarch of the Unified Buddhist Church in Vietnam (UBCV) has sent a message of condolences to French President François Hollande following the series of massive, coordinated terrorist attacks that shook Paris on Friday 13th November 2015. Vietnam’s longest-detained prisoner of conscience, Thich Quang Do expressed the sadness and sympathy of all UBCV Buddhist monks, nuns and followers, and conveyed their prayers to the French President and the people of Paris. Deeply shocked by the tragic events, he said that the Vietnamese “have long experience of suffering, enduring decades of war and unabated political repression” and therefore felt “closely bound to all those who experience suffering in their lives”. He denounced the “acts of destruction perpetrated against innocent citizens [which are] are both cruel and cowardly”, and said that the terrorists, “trapped within a universe of hatred [..] cannot understand that hatred can only engender violence and suffering”. Thich Quang Do, 87, a prominent dissident and outspoken government critic, has spent over 30 years under different forms of detention (prison, internal exile and house arrest), and is currently under house arrest without charge at the Thanh Minh Zen Monastery in Ho Chi Minh City (Saigon). 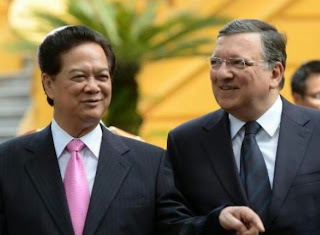 He sent the letter clandestinely to the International Buddhist Information Bureau, asking us to forward it to French President François Hollande. (Full texte below). I am writing on behalf of all Buddhist monks, nuns and followers of the Unified Buddhist Church of Vietnam to express our deepest sympathy and condolences to all the people of Paris who suffered so atrociously in the terrorist attacks on Friday 13th November, in which some 130 people died and hundreds were wounded. We share your burden of sorrow and grief, and pray for you and your people in these dark days. These acts of destruction perpetrated against innocent citizens are both cruel and cowardly. Those who committed them have brought shame and dishonour to their cause. Trapped within a universe of hatred, they cannot understand that hatred can only engender violence and suffering. We are deeply shocked by this unspeakable tragedy, and express our heartfelt sympathies to all the victims, their families and friends. We pray that durable solutions may be found, based on mutual comprehension and understanding. In Vietnam, we have long experience of suffering, enduring decades of war and unabated political repression. We thus feel closely bound to all those who experience suffering in their lives. Today, many Vietnamese Buddhists, human rights defenders and members of other religions are persecuted simply for peacefully expressing their beliefs. I myself have spent three decades in detention, and I am under house arrest as I write to you today. I send this letter through underground channels, hoping fervently that it reaches you safe and sound. PARIS, BRUSSELS, 7 October 2015 (FIDH & VCHR) - In their latest submission to the EU Ombudsman, dated 30 September 2015, FIDH and its member organisation, the Vietnam Committee on Human Rights (VCHR), reiterated their call on the EU Commission (EC) to conduct a human rights impact assessment (HRIA) and introduce the necessary clauses and safeguards before finalising the EU-Vietnam free trade and investment agreement (FTA). FIDH and VCHR detail the reasons why, if finalised without conducting a HRIA and without introducing the necessary human rights safeguards, the FTA would be concluded in violation of EU law. FIDH and VCHR also call upon the other EU institutions to demand that the EU fully comply with its obligations. Despite recognising in its memo dated 4 August 2015 having reached a deal that has “never before been achieved with a developing country”, and that is going “largely beyond […] any other FTA that Vietnam has concluded”, the EC still refuses to assess the impact of the agreement on human rights. It argues, in its opinion to the draft recommendation of the EU Ombudsman, Ms Emily O’Reilly, that a Human Rights Impact assessments (HRIA) is not necessary because the “mix of instruments” it uses to deal with human rights in Vietnam fulfils the “very same overarching purpose of an HRIA” and is sufficient to address the negative impacts the FTA may have. Indeed the EC proposes to rely on dialogues, démarches, development cooperation, and provisions that “are normally included in FTAs”. However despite these tools have shown their limitations in practice and fall far short of providing appropriate mechanisms to measure and respond to the potentially negative impacts of the FTA. “The threat that trade and investment agreements risk causing to human rights is well documented and demands a comprehensive revision of these deals. Instead, the EC turned a blind eye on its own responsibilities and invoked ineffective instruments that have demonstrably failed to prevent the negative impacts that trade deals may have on human rights,” said FIDH President Karim Lahidji. “From the outset, the European Commission has knowingly disregarded any human rights considerations in its quest to conclude its free trade agreement with Vietnam. 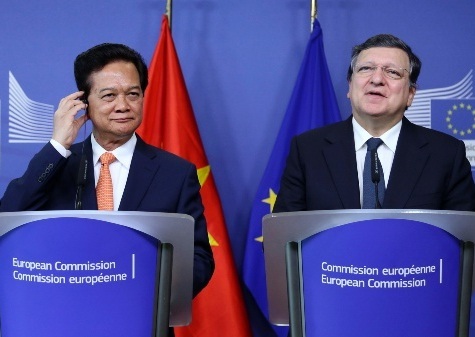 Without strong human rights safeguards, the EU-Vietnam free trade agreement is likely to cause an increase in abuses of social, economic and political rights in Vietnam,” said VCHR President Vo Van Ai. In their 30 pages submission to the Ombudsman (on 30 September), FIDH and VCHR demonstrated the EC’s failure to inform the ombudsman’s procedure and, more broadly, the democratic debate. FIDH and VCHR have clearly documented how superficial the EC’s analysis of the human rights impacts of the FTA is. The submission details the reasons why the solutions proposed by the EC are inadequate to address the new challenges the future EU-Vietnam FTA will pose for human rights, as well as some of the problematic provisions of the FTA and similar agreements. The submission also provides specific recommendations to enhance the human rights safeguards and to revise the agreement. Such safeguards notably include human rights flexibilities, redress and accountability mechanisms for affected communities, and a modification of the substantive provisions regarding investment protection. PARIS, BRUSSELS, 10 August 2015: FIDH and its member organization Vietnam Committee on Human Rights (VCHR) said today that if finalised without conducting a human-rights impact assessment (HRIA) and without introducing the necessary human rights safeguards, the EU-Vietnam Free trade and investment agreement (FTA) would be concluded in flagrant violation of EU law. FIDH and VCHR reiterate their call for the EU Commission (EC) to conduct a human rights impact assessment before finalizing the deal and to introduce the needed clauses and safeguards. FIDH and VCHR call also the other EU institutions to stand firm and require the EU to comply fully with its obligations. On 2 June 2015, UN experts, voicing concern over adverse impact of free trade and investment agreements on human rights, called also for ex-ante and ex-post human rights impact assessments and insisted on the necessity to improve the human rights safeguards in the FTA and investment agreements (1). 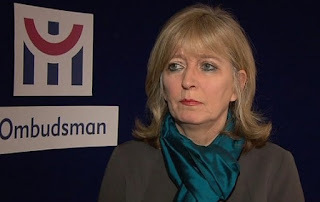 “By ignoring such calls and by precipitating an agreement before the end of the EU ombudsperson procedure, the European Commission suggests it is above the Law, with no institution, public debate or mechanism to prevent this from happening. This questions the Rule of Law in the EU.” said FIDH President Karim Lahidji. In an open letter published today, FIDH and VCHR call upon the European Parliament and the Council of the European Union to revisit the conclusion of the negotiations by the EC, so as to ensure the inclusion of their previous demands to make a human right impact assessment, and to put in place the necessary human rights safeguards into the agreement. 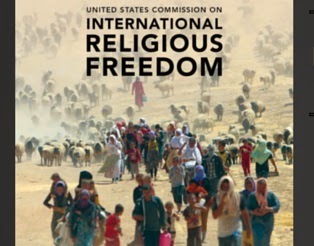 2015 Annual Report PARIS, 30 April 2015 (Vietnam Committee) – In its 2015 Annual Report on International Religious Freedom issued today, the US Commission on International Religious Freedom (USCIRF) placed Vietnam on a list of 17 countries, recommending that they be designated as “Countries of Particular Concern” (CPC) by the US administration for “systematic, ongoing and egregious violations” of religious freedom. The list includes Burma, China, Eritrea, Iran, North Korea, Saudi Arabia, Sudan, Turkmenistan, Uzbekistan, Central African Republic, Egypt, Iraq, Nigeria, Pakistan, Syria, Tajikistan, and Vietnam. According to the USCIRF’s findings, “the Vietnamese government continues to control all religious activities through law and administrative oversight, restrict severely independent religious practice, and repress individuals and religious groups it views as challenging its authority”. It cites widespread abuses over the past year of independent Buddhists of the Unified Buddhist Church of Vietnam (UBCV), Khmer-Krom Buddhists, Cao Dai, Catholics, Hmong Protestants, Montagnards, Mennonites, and Hoa Hao. The report esteems that “at least 100-200 prisoners of conscience are detained in Vietnam, some for their religious activity or their religious freedom activity”. Detailing violations against the UBCV, the report cites the long-term detention of UBCV leader Thích Quảng Độ, the harassment of monks and laypersons at Long Quang Pagoda in Hue in January 2014 and the frequent Police harassments of Buddhist youth leader Lê Công Cầu. 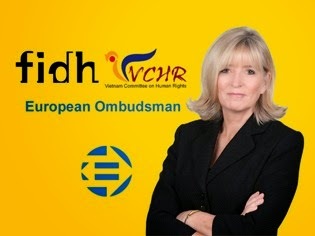 PARIS-BRUSSELS, 14 April 2015 (FIDH & VCHR) - In her draft recommendation adopted on March 26, 2015, the EU Ombudsman found that “the Commission’s failure to carry out a specific human rights impact assessment in relation to Vietnam, constitutes maladministration.” She recommended that “the Commission should now carry out such an assessment without further delay” The EU Ombudsman assessed a complaint filed by FIDH and VCHR following the European Commission’s refusal to take human rights into account in negotiations for trade and investment agreements with Vietnam and concluded that the complaint was well-founded. In their complaint, FIDH and VCHR recalled that EU policies require that a Human Rights Impact Assessment (HRIA) be conducted before a Free Trade Agreement can be signed with a third country. The European Commission has refused to conduct the obligatory HRIA on Vietnam on the basis that a partial assessment was made in 2009. The Ombudsman responded that a partial assessment that covers only certain aspects of the impact on social rights cannot be considered as a proper substitute for a HRIA. Also, the Ombudsman noted the persistent silence of the European Commission towards the lack of HRIA for the investment component and the Investor-state Dispute Settlement mechanism (ISDS). She rejected the Commission’s argument that, given the far advanced state of the negotiation process, carrying out a HRIA would have “unjustifiably burdensome and disproportionate” effects. Noting that “respect for human rights cannot be made subject to considerations of mere convenience,” the EU Ombudsman stated that “as the complainants correctly pointed out, what is decisive is […] to ensure that the FTA with Vietnam, which is still being negotiated, will have no negative impact on human rights”. 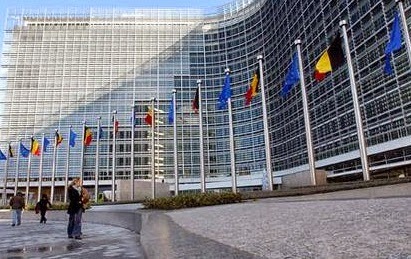 In her Decision, the Ombudsman concluded that the “EU institutions and bodies must always consider the compliance of their actions with fundamental rights and the possible impact of their actions on fundamental rights” and that the EU should “not only ensure that the envisaged agreements comply with existing human rights obligations and do not lower the existing standards of human rights protection, but it should also aim at furthering the cause of human rights in the partner countries”. In that vein, the Human Rights Impact Assessment (HRIA) should allow the commission to asses if the “FTA complies with existing human rights obligations and standards and will have no adverse effects on human rights” and to define the “appropriate measures which would ensure that no such adverse effects would occur”. “This recommendation is an important precedent on several issues” said Karim Lahidji, FIDH’s president. “Beyond the case of EU-Vietnam negotiations, it challenges the lack of HRIA on ISDS and investment agreements or components currently negotiated, like with Burma, China, Jordan, and the US. It insists on the need to conduct proper HRIA and cease the practice of only assessing certain social aspects. It recognizes that HRIA should lead to concrete and efficient measures to ensure that the EU respects human rights, does not lower the existing standards of human rights protection, and ensures that trade and investment agreements will not adversely affect human rights. It rejects the Commission’s well-known argument that the human rights clause and human rights dialogue can be seen as sufficient measures on their own”, he added. Vo Van Ai, President of the Vietnam Committee on Human Rights (VCHR) declared: “The EU Ombudsman’s recommendation is an important step forward for human rights in Vietnam. Without this crucial human rights impact assessment, the EU-Vietnam Free Trade Agreement would enable Vietnam to reap significant commercial advantages from the EU whilst suppressing its citizens’ and workers’ rights with impunity”. Negotiations on the EU-Vietnam Free Trade Agreement are taking place against a backdrop of intensifying repression in Vietnam. In a fierce crackdown on freedom of expression, Vietnam prosecuted and imprisoned at least 65 bloggers and activists in 2013. At least 16 more were arrested or sentenced in 2014. Scores of civil society activists were brutally beaten for staging peaceful demonstrations, and hundreds of dispossessed farmers were wounded in massive protests over forced eviction and land confiscation. International trade and investments can have both positive and negative impacts on human rights. Past experience has shown that, in the current state of affairs, international trade and investment rules have tended to undermine the protection and realisation of human rights. This is of particular note in developing countries with regard to access to medicine, access to water, rights of indigenous peoples, rights to an adequate standard of living, adequate housing, food, health and education, participation, labour rights and the right to work, peaceful gathering, etc. In the negotiation of such agreements, FIDH and the VCHR have consistently called for human rights to be fully integrated within the framework of trade and investment. In particular, conducting human rights impact assessments would enable the EU to prevent negative human rights impacts. This recommendation is endorsed by multiple stakeholders including several UN Special Procedure reports, studies and analyses. Since the Lisbon Treaty, the EU has a legal obligation to ensure that the trade agreements it implements are not harmful to human rights abroad. The EU is gradually progressing in its use of HRIAs, and has included them in its recent negotiations on free-trade agreements with Armenia, Tunisia and Morocco, but not in all, and not in a way that secure the EU really comply with its obligations. While FIDH and the VCHR repeatedly called for the inclusion of a HRIA of the currently negociated trade agreement with Vietnam, the European Commission consistently refused. The organizations’ last resort was to seek the intervention of Ms Emily O’Reilly, the EU Ombudsman to modify the practice. BRUSSELS, March 13, 2015 (EPRID) - The European Platform on Religious Intolerance and Discrimination (EPRID) welcomes the European Parliament’s inclusion of a section on freedom of religion or belief, for the third consecutive year, in its Annual Report on Human Rights and Democracy, which was adopted yesterday. EPRID engaged with Members of the European Parliament of the Committee on Foreign Affairs by making recommendations. However, it echoes the concerns raised from within the European Parliament by Members belonging to the Intergroup on Freedom of Religion or Belief and Religious Tolerance that this section did not speak out on the religious freedom of people of all faiths or none. This is a surprising omission. According to a 2014 study by the Pew Research Center (PRC), the share of countries with a high or very high level of social hostilities involving religion reached a six-year peak in 2012 with religious hostilities increased in every major region of the world except the Americas. The study notes that the sharpest increase was in the Middle East and North Africa, which is still feeling the effects of the 2010-11 Arab Spring and that there also was a significant increase in religious hostilities in the Asia-Pacific region, where China edged into the “high” category for the first time. The PRC’s 2015 data on 2013 shows that around three-quarters of the world’s population continue to live in countries with a high or very high level of restrictions on religion. EPRID encourages the European Parliament to continue its efforts to protect communities of belief and non-belief in the world, and to strengthen and advance freedom of religion or belief for all. 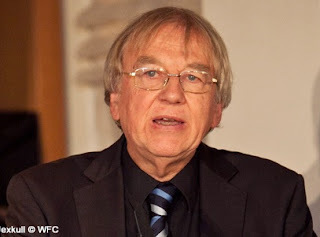 GENEVA, 11.3.2015 (Vietnam Committee) – Speaking at the 28th Session of the United Nations Human Rights Council in Geneva on 10-11 March, the UN Special Rapporteur on Freedom of Religion or Belief Heiner Bielefeldt presented his report on his mission to Vetnam from 21 – 31 July 2014. Whilst observing that “religious life and religious diversity in Vietnam are a reality in Vietnam today”, Mr. Bielefeldt identified many “serious problems”, and declared that “the scope of freedom of religion and belief remains extremely limited and unsafe” in Vietnam. The UN expert expressed particular concern about the situation of Independent religious and belief communities – i.e. those unrecognized by the state. The autonomy and activities “remain restricted and unsafe, with the rights to freedom of religion or belief of such communities grossly violated in the face of constant surveillance, intimidation, harassment and persecution”. He stressed that the conditions of independent and unregistered religious communities was a “litmus test for the development of freedom of religion of belief in Vietnam”. During his visit to Vietnam in July 2014, Mr. Bielefeldt was obliged to cut short visits to An Giang, Gia Lai and Kontum provinces from because of “interruptions” and reports that people he wanted to meet were “heavily surveilled, warned, intimidated, harassed or prevented from travelling by the police”. He and his interlocuters were closely monitored by “undeclared security or police agents”, and privacy of meetings was undermined. 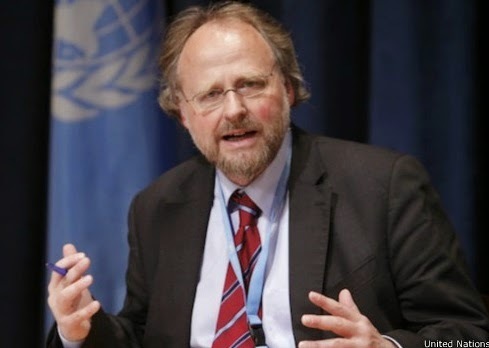 In his report, the UN Special Rapporteur said he was “outraged” by these incidents, as well as the “intimidation, police interrogations and even physical injuries of some of his interlocutors during and after his visit”, which were “in clear violation of the terms of reference of country visits that had been agreed upon by the Government prior to the visit”. Following an analysis of the legal framework, the UN Special Rapporteur observed that the 2013 Vietnamese Constitution, the Ordinance on Belief and Religion (Ordinance 21), Decree 92 contained restrictive provisions that are far broader than limitation clauses stipulated in Article 18 (paragraph 3) of the UN International Covenant on Civil and Political Rights. Moreover, many articles in the Criminal Code condition the exercise of freedom of religion or belief on ”the interests of the State” – and are routinely invoked to arrest and prosecute religious followers. Article 258 on “abusing democratic freedoms to encroach on the interests of the State”, he noted, “gives the relevant authorities carte-blanche to sanction people for all sorts of activities”, including the exercise of the right to freedom of religion, expression, association and assembly. On the issue of registration, regulated under Ordinance 21, which determines whether religious organizations are “recognized” or “unrecognized” by the State, Mr. Bielefeldt stated that the right to freedom of religion or belief is a universal right, one which “cannot be made dependent on any specific act of administrative recignition, allowance or approval” : “It should be clear that the right of an individual or group to their freedom of religion or belief can never be “created” by any administrative procedures. Rather, it is the other way around: registration should serve this human right, which itself must be respected as preceding any registration. On the basis of this general understanding, registration should be an offer by the State but not a compulsory legal requirement” (Paragraph 32). The UN Special Rapporteur raised the case of the Unified Buddhist Church of Vietnam (UBCV) and other “unrecognized” groups. In his report (paragraph 43), he noted the “remarkably dismissive attitude” of members of the State-sanctioned Vietnam Buddhist Sangha towards independent Buddhist groups which do not conform with “majority interests”. Mr. Bielefeldt stressed that freedom of religion or belief is the right of all human beings, regardless of whether they follow a majority religion, a minority community or no religious community at all. During his visit to Vietnam, Mr. Bielefeldt was able to meet UBCV leader Thich Quang Do, Buddhist Youth leader Le Cong Cau and UBCV Deputy Thich Nhu Dat at the Thanh Minh Zen Monastery in Ho Chi Minh City (Saigon). He cites serious allegations of religious freedom violations against the UBCV, including police surveillance, arbitrary arrest and detention, house arrest and confiscation of property. In his conclusions and recommendations, Mr. Bielefeldt made 20 specific recommendations to Vietnam and four to the international community. These included urging Vietnam to: - broaden and solidify the very limited and unsafe space provided for the free unfolding of religious diversity in Viet Nam; - remove or replace vague articles in the Criminal Code that limit freedom of religion or belief, such as Article 258; - clarify that the official registration of religious communities is an offer rather than a legal requirement; - ease restrictions on religious communities under Ordinance 21 and Decree 92; - remove special public security units such as Unit 41/ PA 38; - provide fair and accurate information on religions as part of state education; - ensure the right of prison inmates to exercise their beliefs in detention etc. Mr. Bielefeldt also called for a follow-up visit to Vietnam to assess whether his recommendations had been implemented. After the UN Special Rapporteur on Freedom of Religion or Belief finished his presentation on Tuesday, the delegation from Vietnam took the floor. They denied that there had been any “obstructions” to the UN Special Rapporteur’s visit in July 2014, deplored that he had referred to “inaccurate” information regarding religious freedom violations in Vietnam, and had “failed to depict a balanced panorama of the religious and belief situation in Vietnam”. Vietnam concluded that it could not support Mr. Bielefeldt’s report. The Brussels agreement to extend the EU programme for Greece means a humiliating defeat for the Syriza government. Their attempts to rally support within the union’s governments miserably failed. The German imposition uncompromisingly defending the narrow interests of the financial oligarchy prevailed bearing witness of the impossibility of a social turn within the power structures of the EU. Game over? We believe that there remains a possibility to thwart the EU’s starvation programme. But now it appears that Syriza got frightened by its own audacity. Some harsh words of the taskmaster of the creditors, Wolfgang Schäuble, were enough to corner them. For Syriza did not only promise to end the starvation dictate, but at the same time linked it inextricably with remaining within the eurozone. Varoufakis gambled with high stakes without securing the only possible trump in his hands – the active break with the capitalist elite, the self-steered exit from the eurozone. The current conjuncture would have offered a formidable occasion for a mass mobilisation backing such a historic decision. The possibility to end the starvation programme as promised by Syriza is still there. We strongly doubt that the popular masses as well as many political forces within Syriza and outside of it will accept that nothing should change. The people will continue to demand social improvements. Syriza cannot simply turn within a few days into a new Pasok. Syriza is more than the old Synaspismos guys who tie their fate to the EU. 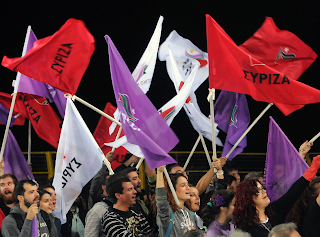 A broad front refusing the capitulation can be built addressing also large parts of Syriza. Maybe the only possibility is a kind of popular revolt against Synaspismos accompanied by an internal coup – to regain audacity! The central demands in the interest of the popular classes are: Exit from the euro – break with the capitalist centre. “The idea that after the fall of the USSR we would have this liberal democracy spreading around the world was of course naive but, in many cases, these are issues of power. We have a Western elite that isn't really interested in democracy unless its friends win. Otherwise, they are happier with a dictator whom they are friendly with. Often if the wrong people win then, suddenly, democracy is seen as not such a good idea,” Jakob von Uexkull, founder of the World Future Council (2007), said in an exclusive interview conducted in Stockholm, Sweden with Nilantha Ilangamuwa, editor of Torture: Asian and Global Perspectives. Mr. Uexkull is also the founder of the Right Livelihood Award (1980), often referred to as the “alternative Nobel prize,” and co-founder of The Other Economic Summit (1984). “We can have the sanctity of the nation-state in a way where every struggle is national. Unfortunately when there is outside interference it is very rare that it is positive. I was encouraging interference in Bosnia in the 1990s and was very glad of it. But most are in the interest of superpowers and have been disastrous, like in Iraq. I cannot imagine things would be as bad now if Saddam Hussain had been allowed to stay in power. I do believe we need to defend the principles of the UN; if a country is attacked it should be defended but, can we intervene to overthrow undemocratic regimes?” he asked. While commenting on Sri Lanka, he said, “I think the situation in Sri Lanka has deteriorated; it has gotten better in Indonesia, etc. 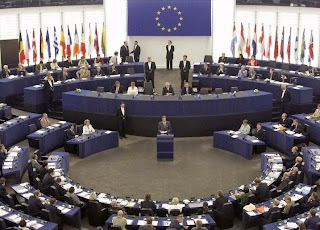 Politicians don’t have much say as ruled by World Bank but Sri Lanka, in many ways, is a tragedy—people’s lives threatened, etc; a situation made complex in the civil war as no one had much sympathy for the Tamil tigers either.” As a past member of the European Parliament (1987-89), Mr. Uexkull, served on the Political Affairs Committee and later on the UNESCO Commission on Human Duties and Responsibilities (1998-2000). He has also served on the board of Greenpeace, Germany, as well as the Council of Governance of Transparency International. He is a patron of Friends of the Earth International and lectures widely on environment, justice and peace issues. Mr. Uexkull has received the Future Research Prize of the State of Salzburg, Austria (1999), the Order of the Cross of Terra Mariana of the Republic of Estonia (2001), the Binding Prize (Liechtenstein) for the protection of nature and the environment (2006) and the Order of Merit, First Class of the Federal Republic of Germany (2009). In 2005, he was honoured by Time Magazine as a “European Hero” and, in 2008, he received the Erich Fromm Prize in Stuttgart, Germany. He is also a recognised philatelic expert with publications such as “The Early Postal History of Saudi Arabia” (London, 2001). Born in Uppsala, Sweden, Mr. Uexkull is the son of author and journalist Gösta von Uexkull and grandson of biologist Jakob von Uexkull. After schooling in Sweden and Germany, he graduated with an M.A. (Honours) in Politics, Philosophy and Economics from Christ Church, Oxford. He holds dual Swedish and German citizenship. Mr. Uexkull is married and has three children. He lives with his family in London. As the founder of the Right Livelihood Award, he recalled past experiences and said, “I saw it was needed so I set it up. It was criticised and people thought it was crazy or a CIA plot or a KGB plot at the time. Swedish newspapers, etc. One Member of Parliament believed in it and she convinced her colleagues and, after five years, we were invited to present in Parliament and have been able to do so every year since, which I think it is a remarkable attribute of Swedish democracy and Swedish parliamentarianism. Parliament has no say in the choice. We don’t have to inform them beforehand who we have chosen; that is remarkable and I am very honoured and overwhelmed that we have been allowed that.” “Even though there have been times once or twice where there were some problems with one party and I went to talk to them and it was okay. Challenge is making the award well known so that the recipients get support and their work is spread. The idea of an award is publicity and inspiring others. I think we have succeeded. There are many more awards today. It is not an anti-Nobel prize and it is also for those who bring the greatest benefit to humanity, like Alfred Nobel wanted,” he added. The interview will appear in the upcoming issue of the magazine, which will be published soon. PARIS-BRUSSELS, 16 January 2015 (FIDH & VCHR) - The European Union (EU) must use upcoming talks with Vietnam to demand that Hanoi urgently address serious human rights violations, FIDH and its member organization Vietnam Committee on Human Rights (VCHR) said today. The two organizations made the call ahead of the fifth EU-Vietnam Human Rights Dialogue, which is scheduled to be held in Brussels on 19 January. “As the human rights situation in Vietnam shows no signs of improvement, the EU must use the dialogue to present clear, measurable, and time-bound recommendations for the Vietnamese government to implement,” said FIDH President Karim Lahidji. EU recommendations must include an end to the harassment and arbitrary arrest of bloggers, activists, religious followers, and human rights defenders as well as the immediate and unconditional release of all political prisoners. With regard to economic, social, and cultural rights, the EU must urge Vietnam to implement all the recommendations made by the UN Committee on Economic, Social, and Cultural Rights (CESCR) on 15 December 2014 (2). The CESCR’s concluding observations echoed the findings and recommendations contained in a report jointly released by FIDH and VCHR on 11 November 2014 that documented serious and ongoing violations of economic, social, and cultural rights in Vietnam. The CESCR denounced the absence of effective and accessible remedies for victims of violations of economic, social, and cultural rights. It expressed concern over the intimidation of individuals who claimed violations of their rights, such as those protesting against forced evictions or poor working conditions. 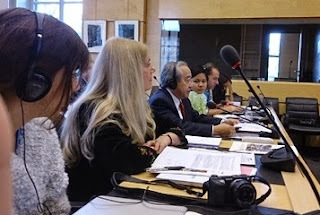 The CESCR also deplored the widespread economic exploitation of children and the adverse impact of development programs on the enjoyment of economic, social, and cultural rights by ethnic minorities. The CESCR called for the establishment of a national human rights institution that complies with the Paris Principles and the creation of an enabling environment for the free establishment and functioning of independent civil society organizations. It urged Vietnam to improve worker rights by removing excessive restrictions on the right to strike, enabling citizens to form and join trade unions of their choice, and repealing legislation that authorizes child labor. “The UN Committee’s conclusions are significant because they underscore the link between economic activities and human rights abuses in Vietnam,” said VCHR President Vo Van Ai. “In an effort to strengthen economic relations and regain its position as Vietnam’s biggest export market, the EU must not overlook the serious human rights violations that continue to take place in the country.” On 7 August 2014, FIDH and VCHR filed a complaint to the EU Ombudsperson to demand that the office address the European Commission’s refusal to take human rights into account in negotiations for trade and investment agreements with Vietnam. As a result of the complaint, the EU Ombudsperson formally opened a case on 3 September 2014. GENEVA, 11 November 2014 (VIETNAM COMMITTEE) – In a new joint report released at the United Nations in Geneva today, the Vietnam Committee on Human Rights and the FIDH document serious violations of economic, social and cultural rights in Vietnam. The 36-page report, entitled “Violations of Economic, Social and Cultural Rights in Vietnam”, (also available in Vietnamese) was released at the 53rd Session of the UN Committee on Economic, Social and Cultural Rights (CESCR) which is meeting in Geneva (10-28 November 2014) to examine the implementation of the UN International Covenant on Economic, Social and Cultural Rights (ICESCR). The FIDH-VCHR prepared the Shadow Report to provide the UN experts with evidence and analysis on the grave ongoing violations of economic, social and cultural rights in Vietnam. The Vietnamese government presented its report on Monday 10 November 2014, with a delegation of 19 officials led by Vice-Minister for Planning and Investment Nguyen Chi Dung. The 18-member Committee of experts first heard statements from VCHR President Vo Van Ai, Vice-President Penelope Faulkner and other civil society representatives before questioning the Vietnamese delegation. The session concluded on Tuesday afternoon. The CESCR will present its conclusions and recommendations on 1st December 2014. Although Vietnam acceded to the ICESCR in 1982 and has a binding obligation to submit regular reports to the Committee, it has not reported to the CESCR since 1993. “The ICESCR is one of the pillars of international human rights protection”, said Vo Van Ai, President of the Vietnam Committee on Human Rights. “Vietnam’s 21-year delay in submitting the report and the empty rhetoric of its submission show its lack of concern for the people’s’ economic, social and cultural rights. Victims of abuses – especially vulnerable populations such as women, children, ethnic minorities and the rural and urban poor – have no mechanisms to protect their rights and no means to redress them. Human rights defenders who denounce rights abuses are harassed and detained”, he told the CESCR. The FIDH and the VCHR report reveals alarming wealth disparity and social inequalities in Vietnam. Since Vietnam opened to a free market economy under the policy of “doi moi” (renovation) in the late 1980s, the country has undergone rapid growth and economic transformation. However, economic liberalization under one-Party political control has led to growing inequalities between the ruling elite and the rest of population. Whereas Vietnam ranks high in the world in the increase of “super rich” people (people with assets of over US$30 million), one in every five Vietnamese lives under the poverty line, and 8% live in extreme poverty. Millions of others live just above the poverty threshold and remain vulnerable to falling back into poverty at the slightest shock. Social inequalities are not only due to the rising income gap, but also discrimination on the grounds of political opinions, religious affiliations or ethnicity. The report cited field-research by the World Bank which showed that people who do not have good connections with the Vietnamese Communist Party receive unequal treatment in health care, education, employment and access to land. Forced evictions and State confiscation of land for development purposes, exacerbated by endemic official corruption and power abuse have left hundreds of thousands of farmers homeless, and sparked off violent clashes in Van Giang, Vu Ban, Con Dau, Duong Noi and elsewhere. In the workplace, sweatshop working conditions and low pay have led to a rising number of strikes, yet the official Vietnam Confederation of Labour takes no action to defend worker rights. Child labour is widespread. The report cites a 2013 Circular which legalizes “light work” for children from 13 to 15 years old. Citizens who denounce abuses risk harassments, intimidation and imprisonment. The FIDH and VCHR state that scores of bloggers, land rights and worker rights activists, human rights defenders and members of religious minorities are currently detained for their advocacy of economic, social and cultural rights. In one trial in January 2013 alone, 22 peaceful environmental activists were charged with “subversion” and sentenced to terms ranging from 10 years to life imprisonment. Seven ethnic H’mong in Tuyen Quang were imprisoned in March 2014 simply for practicing their faith. Most of these activists are charged under vaguely-worded articles in the Criminal Code such as “abusing democratic freedoms,” or “spreading anti-State propaganda” which are totally inconsistent with the ICESCR. Presenting the joint FIDH-VCHR report to the CESCR, Mr. Vo Van Ai denounced Vietnam’s use of the law as a tool to suppress human rights and maintain political control. He listed legislation such as the Law on Trade Unions, the Publications Law, the Cinematography Law, the Cultural Heritage Law, Decree 97 on Scientific Research, Internet Decree 72, Religious Decree 92 and numerous regulations limiting cultural, spiritual and religious practices. "Vietnam’s periodic report cites a host of regulations and laws but gives no information on their content or application. Thirty two years after Vietnam’s accession to the ICESCR, its citizens are still deprived of their fundamental human rights", he said. He also denounced pervasive State censorship in Vietnam. A recent publication in Vietnamese of Thomas Bass’s book “The Spy who loved us” (on former Time correspondent and Hanoi spy Pham Xuan An) was censored in 444 places, despite contractual agreement with the author. Censorship of the Internet has forced many Vietnamese websites and blogs to operate outside the country. Mr. Ai highlighted the report’s finding on the teaching of history in Vietnam. The only history book in use in schools is published by the state. Not only does it distort history in many instances, but the style is close to political propaganda and potentially incites children to hatred. Many academics in Vietnam have also denounced this “politicization” of history teaching and called for the use of alternative teaching materials. In conclusion, the FIDH and VCHR made 37 recommendations for progress in Vietnam, including trade, business and human rights; trade union rights, the right to health and education; non-discrimination; land rights; freedom of expression and cultural rights; independence of the judiciary and ratification of human rights instruments. BRUSSELS-PARIS, 12 August 2014 (VCHR & FIDH) - In a complaint filed in Brussels on 7 August 2014, the International Federation for Human Rights (FIDH) and its member organisation Vietnam Committee on Human Rights (VCHR), requested that the EU Ombudsman address the European Commission’s refusal to take human rights into account in negotiations for trade and investment agreements with Vietnam. Negotiations on the EU-Vietnam Free Trade Agreement are taking place against a backdrop of intensifying repression in Vietnam. In a fierce crackdown on freedom of expression, Vietnam prosecuted and imprisoned at least 65 bloggers and activists in 2013, and at least 14 more have been arrested in the first half of 2014. Scores of civil society activists were brutally beaten for staging peaceful demonstrations or holding human rights debates. Hundreds of dispossessed farmers were wounded and several others killed in massive protests over forced eviction and land confiscation. “It is inadmissible that the European Commission is negotiating a Free Trade Agreement without any regard for human rights in Vietnam. Over the past year, human rights abuses have reached a climax. Top EU officials have repeatedly denounced the harsh sentences of bloggers and human rights defenders, yet the Commission proposes “business as usual” – and even upgrading trade relations with Vietnam. We call upon the Ombudsman to address this and help put human rights back at the centre of the EU-Vietnam relationship” said VCHR President Vo Van Ai. Trade and investment agreements have the potential to exacerbate human rights violations in the context of labour rights, access to land and natural resources or when recourse mechanisms are designed to protect investors and not affected communities. “These human rights violations can be prevented by conducting human rights impact assessments and by including safeguards in trade and investment agreements that address violations, or offer redress mechanisms”, said FIDH President Karim Lahidji. “We believe that the European Commission’s refusal to carry out HRIAs is inconsistent with its legal obligations to respect, protect, and fulfil human rights”, he added. Despite numerous calls by FIDH and VCHR and a resolution of the European Parliament for the European Commission to include human rights impact assessments (HRIA) in the ongoing trade and investment negotiations with Vietnam, the EU Commissioner for Trade stated that the Commission did not “envisage carrying out a specific human rights impact assessment for the EU-Vietnam Free Trade Agreement”. FIDH and VCHR believe that the European Commission’s refusal constitutes a case of maladministration. The two organizations urge the EU Ombudsman to address the situation and recommend that the European Commission review it.